I love spreading the good word about people doing awesome things in the Okanagan. It’s a pretty kickass place to live, for a number of reasons – lately because of local eats and drinks. I help light the way to deliciousness and a grand experience. So when folks ask me about some of the best places to eat/drink in the Okanagan, it’s easy to cobble a list together on whatever is available – and yes, I’ve been known to write on napkins. Since it’s vacation season and I’m becoming somewhat overwhelmed with “can you make some recommendations?” requests, it’s best for my internal peace if I tackle the query in a public format – not just because I’m feeling the +30C laziness (which kicked in July 1), but also to save you time in asking. 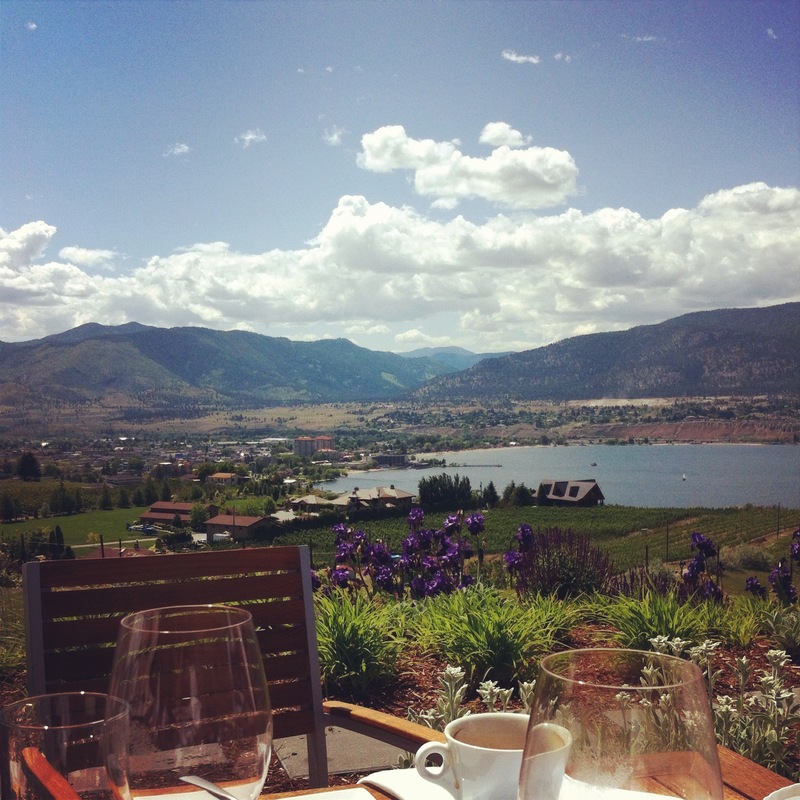 In no particular order, here’s a not-exhaustive-by-a-long-shot 2014 Summer List Of Awesome Okanagan Eats. This option is at top of the list as these restaurants are often top of the budget. Winery dining can be pricier than non-winery dining, for a variety of reasons – but there’s a better than average chance you’ll have a good experience. Expensive doesn’t mean better – but each year the bar rises. As long as diners realize the lunch special refers to the food rather than the price, you’ll do okay. Miradoro Restaurant at Tinhorn Creek: Although I (and my fella) dislike onions, peppers, and tomatoes (in that order), I’ve eaten my fair share of each when prepared by Chef Jeff Van Geest and his team. Two words: flavour integration. The setting is stellar, the menu is innovative without being scary, and every foray into the unknown is partnered with something familiar. I’ve eaten strange and delicious things – also pizza, fluffy-as-a-cloud gnocchi, and some of the best trout EVER. Let restaurateur Manny choose your wine pairing – he’s gifted. 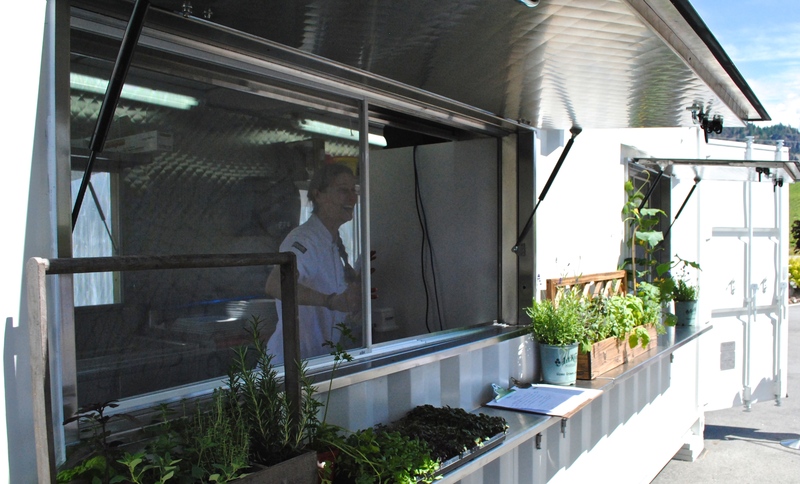 Joy Road’s Vineyard Kitchen at Black Hills: It’s not a restaurant – it’s a modified shipping container-as-kitchen, owned by Black Hills and operated by Joy Road Catering. Chefs Cameron Smith and Dana Ewart are culinary darlings in British Columbia – everyone I know loves their food and them. This is Joy Road’s foray into fixed address food, and I’d cross my fingers for them except I’m too busy stuffing myself with everything they make: house-cured charcuterie, traditional flat bread pizzas, decadent desserts. Consider it a la carte-style small plates to share and tasty bites for the road-weary explorer with a discerning palate. The Bistro at Liquidity Wines: Before the winery opened, my fella and I watched a renovation of what we thought was a really sweet house: mid-century modern updated with a concrete-and-glass cool vibe and one helluva view. Then, the winery opened and blew our minds. This year Liquidity launched their restaurant with chef Rob Walker at the helm – hot damn, the man can cook. So you’re having dinner in your dream house but it’s catered by this super nice guy who makes delicious food, and you don’t have to wash a dish. How perfect is that? I ate most of the potted salmon someone else ordered (sorry, Julie) and inhaled my halibut without much poise, but I don’t care. It was good. 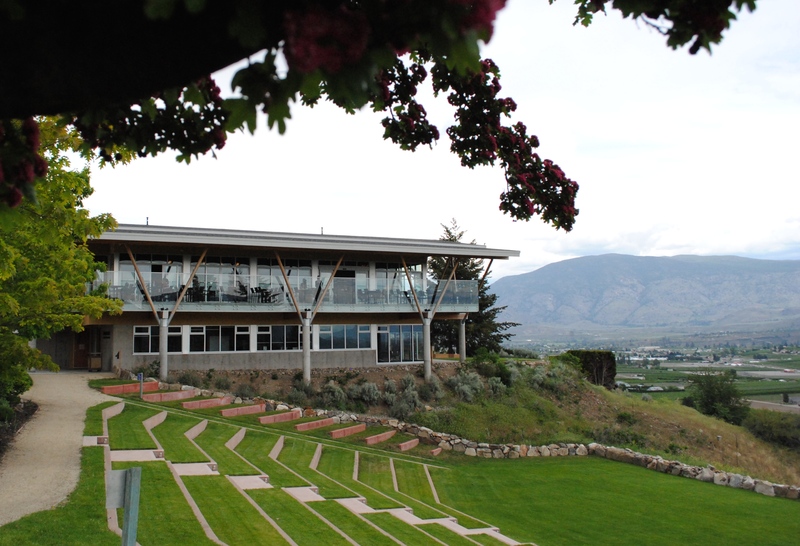 The Vanilla Pod at Poplar Grove: The patio is enormous and offers another jaw-dropping view. Restaurateur Paul is a kind host, and service is spot-on; some of my favourite service people have migrated here from around the valley. Chef Bruno Terroso brings a comfortable feeling to every dish – they might not seem complicated but I’m pretty sure I wouldn’t be able to replicate one of them. Paella! Have it. Sunset Organic Bistro at Summerhill: The people are outstanding, the place is welcoming, and the food is delicious. Do I need to mention the vineyard vista? Probably not. This is an all-organic bistro, down to the flour used in the focaccia. There’s a good chance a family member will be wandering around – say hi, introduce yourself, and strike up a conversation. They seem to always make time for that, and I love it. I have no photos – that must be rectified, stat. These are where you tuck in like a local – some serve breakfast and lunch while others serve lunch and dinner, so be sure to check their respective websites to avoid disappointment. Many of these people and their digs are dear to my heart, so remember that when you’re rating them on Les Food Review Websites. I’ll defend them to my last breath. Brodo Kitchen, Penticton: Part weathered-barn-board kitsch, part deli-counter, part restaurant, all awesome eating. Chef Paul and Holly run a tasty joint. Order at the counter – if it’s slow, they’ll bring the food to your table but be prepared to listen for your order and grab it from a chef’s hands. If my last meal was here, I’d be a happy gal. The Bench Artisan Food Market, Penticton: The not-so-secret breakfast spot for locals and visitors who wish they were. Organic, fresh, tasty. Chef Stuart and Heather do great things here. I’m quite partial to the egg salad sandwich – it’s available in 1/2 orders, and if you get it you’ll know why. doLci Deli & Catering, Osoyoos: House cured bacon. Shall I continue? Okay – Annina is a talented chef who has a smile that can light up a room. Breakfast made me giddy. Sneak through the tables and head for the back: there’s a small patio that doubles as an oasis and is perfect for lingering. 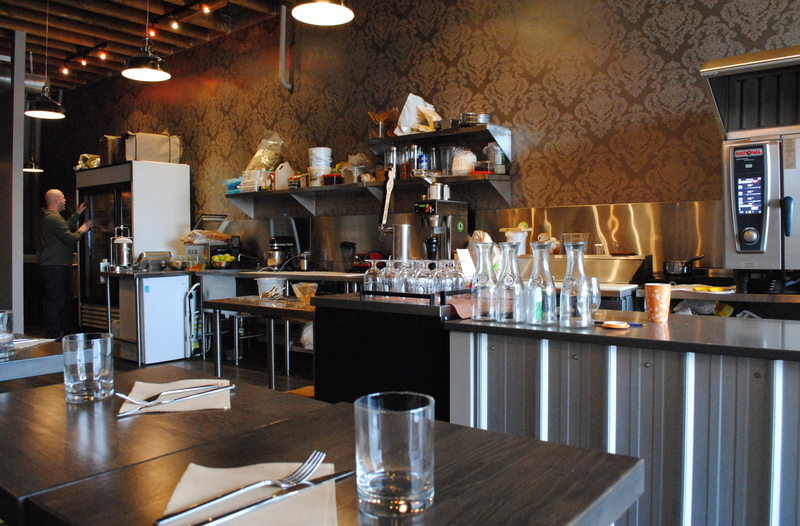 Salted Brick, Kelowna: Homemade lard, house cured meat, and picnic to-go lunches. Chef Jason has mischievous bright eyes and an easy disposition – let him lead you through a series of small plates and you’ll be a happy customer. Small menu, with focus – and a bent on local. It’s not all about sitting down to a meal in a restaurant. Sometimes, you need to boldly go where you’re not sure you should eat without guidance from someone who’s been there – like lunching in a parking lot. Seriously. 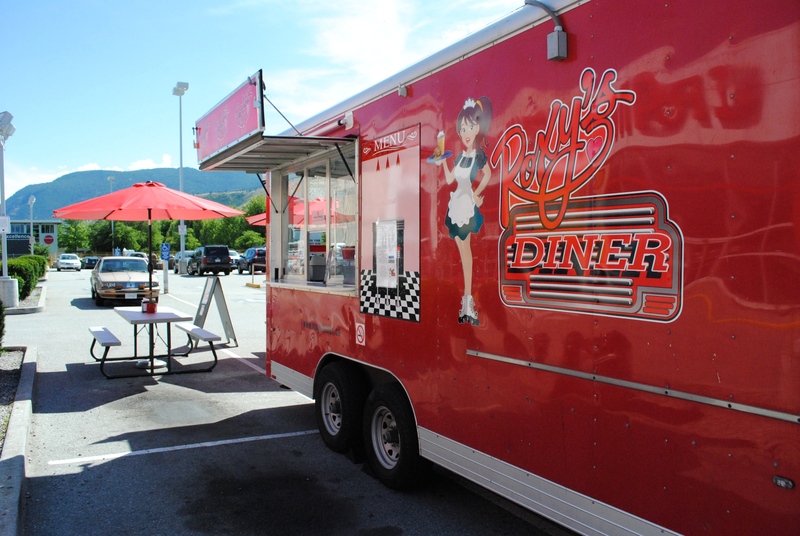 Roxy’s Diner Food Truck, Canadian Tire Parking Lot (most days), Penticton: That’s right – I’m suggesting you eat in a parking lot, and you’ll thank me for it. Chef Vince and Christine serve diner-food-done-right in this retro-style truck that would look right at home at an old-timey fairground. The difference here is you’ll be eating delicious homemade food. Try the Bringing Home the Bacon Bacon Dog, or the South Philly-kanagan Cheesesteak (ordering the Winner Winner Chicken-n-Waffle-Dinner goes without saying). It’s all good. I-can’t-remember-its-name-Mexican-food-stand, south of Oliver on Highway 97: No one I know can ever remember the name of this place, so locals refer to it as “the Mexican food stand just south of town with the picnic tables out front.” Really, we do. The food is authentic and delicious, and there’s a strong possibility you might not get what you ordered but you’ll eat it anyway and love every bite. We did. Take cash, and patience – they’re busy. Hammer’s House of Hog, Highway 97, south of Oliver (near the above): A food truck that’s more cart than truck, and damn cute with great food. Southern-esque barbecue, but not quite, and that’s okay – this is the Okanagan and we’re happy to have a selection of good food. Jampee’s Thai Kitchen, EZ Gas Parking Lot on Highway 97, north of Oliver: A multitude of reports that are always the same – damn good Thai food. Get your pad thai on in a parking lot, and gas up the car after. Convenient and tasty in one. Have a favourite that I missed? I bet you do – there are oodles more than I can list in one blog post without losing your attention completely. Feel free to add your favourites in the comments – you’ll be doing everyone a solid.